Microvascular injury and repair following tracheal transplantation. Following orthotopic transplantation of trachea, revascularization occurs within four days and is associated with perfusion and return of blood flow. This revascularization response involves efficient physiological anastomoses between donor and recipient microvessels. This early efficient repair and/or homeostatic angiogenesis is required for normal graft function. 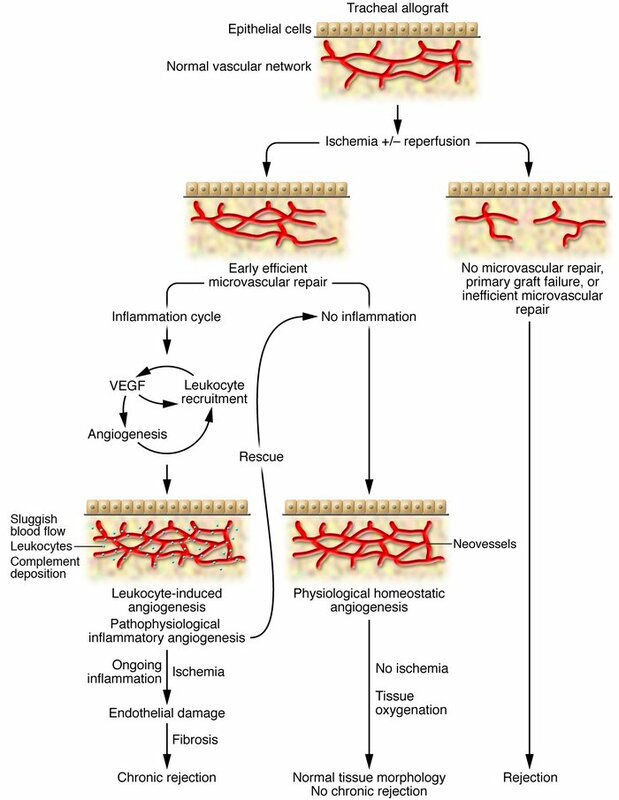 After reperfusion, in the absence of inflammation (such as occurs in syngrafts or immunosuppressed recipients of allografts), physiological homeostatic vascular remodeling occurs, microvascular integrity is maintained, and tissue morphology remains normal. In contrast, as leukocytes infiltrate allografts in association with rejection, pathophysiological inflammatory angiogenesis occurs and is only sufficient to sustain graft function minimally. This inflammatory angiogenesis reaction likely facilitates ongoing leukocyte recruitment and endothelial damage, eventually leading to ischemia and a cycle of microvascular injury and hypoxia that cannot sustain tissue function. The end result of this cycle is tissue fibrosis and chronic rejection. In this issue of the JCI, Babu et al. (7) demonstrated that early physiological homeostatic repair and the absence of inflammation will sustain long-term tissue function and morphology.